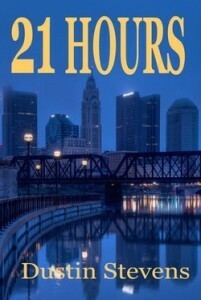 21 Hours by Dustin Stevens is a story about a subject near and dear to any parent or family member: child abduction. As a first time mother, I used to wonder how I would feel if my daughter was kidnapped. Living in Arctic Canada wasn't a concern because everyone knew each other and our town was only accessible by air, which provided a greater sense of security. However, when my daughter and I went on annual vacation, it was a different matter entirely: I had one set of eyes to make sure we both stayed safe. Not that we traveled to dangerous places and took crazy chances with our lives but we did frequent shopping malls and parks. I always had a camera in front of my eyes, with my daughter in the viewfinder. Advance the calendar 19 years. Not only do I have two additional children, I have two grandchildren. The same concerns are present when traveling today but I've learned to relax while keeping an eye on our surroundings. With my children, I've driven across Canada numerous times. We've taken several road trips to various parts of the USA as well. Though I didn't, and don't, allow personal fears and potential "what ifs" to ruin vacation, my instincts have became honed throughout the years. I listen to my gut more than what a person may tell me; if something feels right, great; if it feels off, I'm going to listen to my gut - every time - because I'd rather not take a chance of what may happen if I don't. Now...a sobering question... what if I was walking into my house - the place I felt safer than anywhere else in the world, the place where I could finally let my guard down - and someone attacked my family? What if I was left unconscious and, when I came to, I realized one of my children had been kidnapped? This is what happened to Lex and her small family, and there was only one man she trusted to find her daughter: her brother, Felix, who worked on a cattle ranch in Wyoming. In the shoes of a parent, it's the scariest thing I can imagine. It wouldn't matter if my child or grandchild was a few months old or ready to go off to college; not knowing where he or she was would be my undoing. The questions I would ask myself and the scenarios my mind would imagine could, literally, send me over the edge. If the kidnapped child happened to be my niece and I was put in charge of finding her, yes, my imagination could drive me wild, but I would have the added stress of the expectation placed upon me to find her. It would not be a comfortable position to be in; I don't envy those who find themselves in such a position, even if they feel like they are doing something. Why did Stevens choose this title? Statistics dictate that, after a child has been abducted, the window of opportunity for finding her decreases after 48 hours; 21 hours is the amount of time Felix had remaining to find his niece after driving from Wyoming to Ohio where he met with his sister and the lead detective on the case. I just had to see this story through because I had to know what happened to Lex's little girl, Annie, even if my heart caught in my throat sometimes. In fact, I stayed up until daybreak because I couldn't go to sleep without knowing the outcome of this story. Even more than the intriguing plot of 21 Hours, what stands out to me is one man's determination to find his niece no matter which obstacles stood in his way. He had made a promise to himself that he would find her or would die trying. He had to endure physical pain and hardship but he kept his mind focused on one picture at all times - the face of Annie, his little niece - which enabled him to rise above the circumstances in which he found himself. Who knows? If Felix was to live another 50 years, would he look back upon his race to find Annie as the longest 21 hours of his life? If you would like to read this action-packed crime-fiction thriller suspense novel, just click on the book cover which will take you to its page on Amazon.